This field shows the direction in which the signal crosses the Hit crossing offset value. Negative, Zero, and Positive are defined relative to the offset value. The data type is slHitCrossingType which is an enumerated data type. See Use Enumerated Data in Simulink Models (Simulink) for more information. For example, if HitCrossingOffset is set to 2, a rising signal crossing this offset value would be recorded as a NegativeToPositive hit crossing. 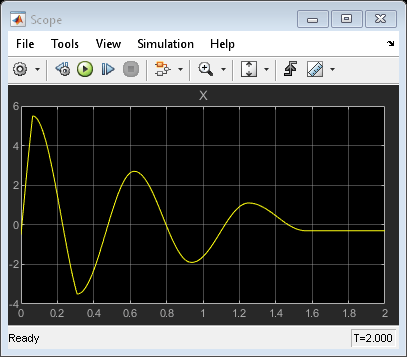 Hit crossing offset value as specified by the Hit crossing offset (Simulink) parameter. If the SimEvents message output signal crosses model reference boundaries or is used as an input to a Stateflow® chart, you need to create a bus object for the message. See Tips (Simulink). Select to enable zero-crossing detection. For more information, see Zero-Crossing Detection (Simulink). Specify the sample time as a value other than -1. For more information, see Specify Sample Time (Simulink). This parameter is not visible unless it is explicitly set to a value other than -1. To learn more, see Blocks for Which Sample Time Is Not Recommended (Simulink). A hybrid system with both continuous time and discrete event sections. The discrete event part models tanks, represented by entities, which are being queued and need to be filled up. Each tank has a "Capacity" attribute. The continuous time part models the process of filling up a tank, modeled by an Integrator. When a tank is filled to capacity, this event can be detected by a Hit Crossing block, which will generate a message corresponding to this event. The generated message will trigger the server to release the tank.